After a long hiatus due to moving house and various other things, I'm finally back to getting this thing running. I've just had the injectors checked and 2 of them were completely goosed, but the tester recommended replacing all of them. So, where is the best place to pick up 2x 720cc and 2x 850cc? Google isn't bringing up a lot of UK choice so far. I'll ask the tester when I pick the old ones up this aft, but thought I'd see if anyone on here a any recommendations. So I'm trying to track down the injector part numbers. The original engine builder has size written down as 720cc primary and 850cc secondary. The number on the injectors are all partially worn, I've managed to source the 720's, but I couldn't get a full number on the 850's. After finding a list of denso numbers, the only one that can be a match from the numbers I can see is coming up as 660cc??? Found a post on a forum with someone who had some and had them cleaned and flow balanced @ 43.5 PSI, which came out as 690cc/min. 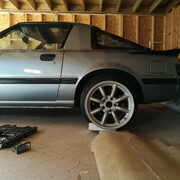 So I guess the best course of action is to match the part rather than the notes as I just want it to run on the current ecu tune which should be set up for what was in. Injectors have arrived, will get them in over the next few days and see if she runs. Gonnna have to re-use one of the two 'spares' as I could only source 3 new ones. 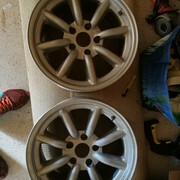 half of my new wheels have arrived, one has a small amount of curb rash but nothing major, gonna get them refurbed and painted bronze. After throwing some old but dry plugs in, she fired up, then instantly died as I touched the CAS. Closer inspection revealed that the wires in bad condition where they enter, so a quick solder job and she fired right up. Adjusted the CAS all the way to the right and she ran a lot better. 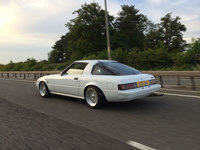 Will take her for a small shake-down drive this evening down the lane, then MOT later in the week. Still sounds a touch tractor like though, whaddya think? You have a leak, on the exhaust side I would say. Hard to pinpoint. Is your turbo spooling up? Exhaust leak was my first guess, but I couldn't quite pinpoint it, will have another listen tonight. Turbo: pretty sure it is. Check exhaust manifold to engine joint and /or the collector further down where it goes 2 into one. It's deffo a leak from the exhaust manifold, sounded way worse than at the weekend. Will start stripping it down tomorrow. She still fires up though, so its all progress. Loving the wheels. Are these the pair of 16s that were on eBay?